At Muscle Shoals, Alabama, on the Tennessee River, a $145,000,000 hydro-electric plant and two munitions factories had been built during the First World War. After the war, Senator George Norris of Nebraska and John Rankin of Mississippi drafted a bill that would enable these facilities to be converted for peacetime purposes. 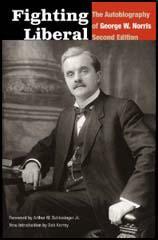 Norris, a progressive Republican, twice persuaded Congress to pass this legislation, but both times it was vetoed by the president, first by Calvin Coolidge, and then by Herbert Hoover. They both argued that as the plant would be government owned, it would be an example of socialist planning. Something that both men were strongly against. 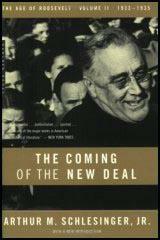 Franklin D. Roosevelt agreed with what Norris was trying to do and believing it would stimulate the economy of one of the poorest regions in the United States, gave it his full support. On 10th April, 1933, Roosevelt asked Congress to set up the Tennessee Valley Authority (TVA). The munitions factory became a chemical plant manufacturing fertilizers and the hydro-electric plant now generated power for parts of seven states (Virginia, North Carolina, Georgia, Tennessee, Kentucky, Alabama, Mississippi). The development of the TVA upset many people in the United States. They complained that a government agency should not compete with private utility companies in the production and distribution of electric power. Representatives of these private companies complained bitterly when it became clear that the unit cost of TVA power was lower than the rates they were charging. 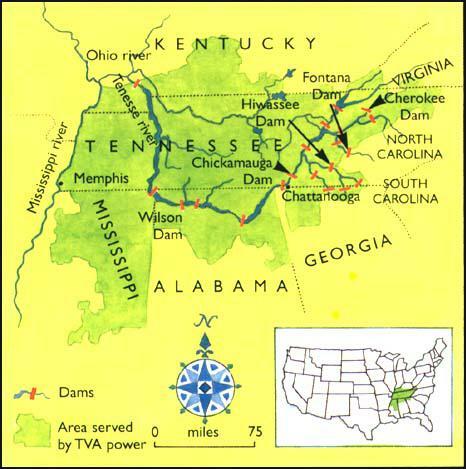 The 34 dams under the control of the TVA on the Tennessee and Cumberland Rivers not only produced electric power but also played a role in flood control, irrigation and navigation. The TVA also served several other purposes including reforestation, preservation of wildlife, production of fertilizer and improved use of agricultural land. Norris Dam, provided for under the original TVA act, is about twenty miles to the northwest of Knoxville on the Clinch River, a Tennessee tributary. It holds back the largest amount of flood waters except that which will be impounded by Kentucky Dam. Norris Dam has had a very material effect upon the navigability of the Tennessee River itself and upon the floods of the Tennessee, Ohio, and the Mississippi. It holds back the surplus waters of a number of Tennessee tributaries which otherwise would discharge a huge volume of water into the main river at a time when flood conditions are aggravated. In 1937 one of the most damaging floods east of the Mississippi that have ever been recorded would have been intensified had it not been for the effect of Norris Dam upon the flow of the Ohio and the Mississippi. The city of Cairo, located on the Ohio River, between the mouth of the Ohio and the mouth of the Tennessee, often has been damaged greatly by floods. There is no doubt but the city would have been engulfed and possibly destroyed in this particular case had it not been for Norris Dam. It may seem impossible that Norris Dam, roughly seven hundred miles distant from Cairo by river, should have saved that city from destruction. Yet the waters of the Ohio at Cairo had risen to the danger point and then above, the levees for the city's protection were in danger of being washed out. At the critical hour, eminent engineers, making careful computations, reached the conclusion that the huge volume of flood waters stored back of Norris Dam had saved Cairo and had greatly diminished the floods along the entire Ohio and Mississippi. I have attempted to sketch briefly PWA's direct contribution to national defense. Because of the leeway that it had under the law to make grants to cover the entire cost of Federal projects, PWA was able to undertake some others that, while useful in peacetime, are just as important for war purposes as are munitions themselves. I particularly have in mind hydroelectric power developments. Where would we be today with a scarcity of power already making itself felt, and a greater lack facing us during the next few years, if we had not gone in for the most stupendous program of power development in history? We claim no credit for the conception of Boulder Dam or of the TVA. But we hurried Boulder Dam to completion after we came in in 1933 and finished it two years ahead of schedule. The power now being generated there is indispensable to the war. And while the main credit for the TVA must gratefully go to that really fine elder statesman, George W. Norris, the records will show that it was PWA encouragement - encouragement in the form of coin of the realm - that gave it not only the means but the opportunity to expand into the vitally important project that it is.